SOCHE and Innovative Educators have partnered to provide SOCHE members access to more than 100 professional development training courses, as well as access to unlimited live webinars. You can find these resources in our Tutorials page, under the Resources section of the CTL website. To register for an upcoming live webinar, go to the SOCHE Education Live Webinars webpage and follow their 4 easy steps for registration. 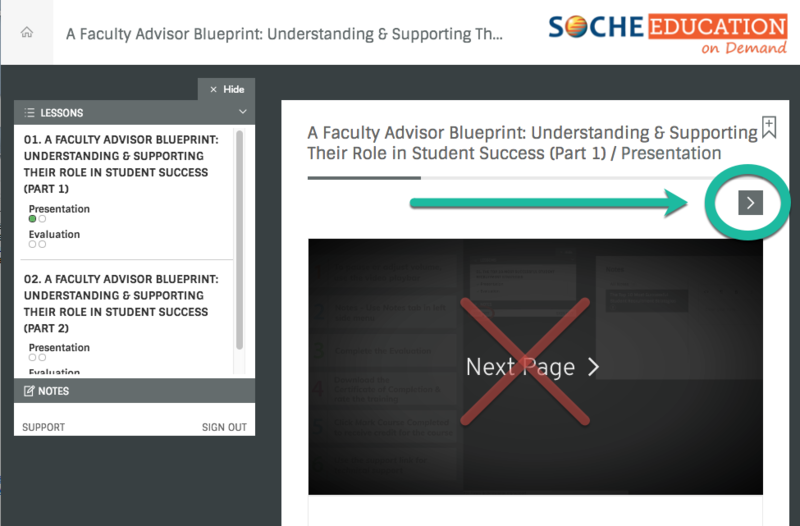 To view an on demand webinar, go to the SOCHE Education on Demand webpage and follow their simple 2 step process. Currently, the SOCHE Education on Demand collection of training videos has a technical glitch that will hopefully be resolved soon. In the meantime, when you select an on demand webinar, you may be presented with a 39 second welcome video from Go2Knowledge. When the introductory video finishes, the video will fade out and show you a link to advance to the “Next Page.” Unfortunately, this “Next Page” link simply re-directs you back to the on demand webinar homepage. To advance forward to the actual webinar, you must press the small right-arrow to the top-right of the video frame, as indicated on the screenshot below.